I am sorry my regular e-zine has become somewhat infrequent as of late but I have been engaged with competition fishing. I know this does not appeal to everybody and I completely accept the alternative view that river fly fishing is a form of escapism to a place of you versus nature and that is more than competitive enough. If however like myself you are interested in developments at the cutting edge of Fly Fishing and enjoy the thrills and drama that competitive angling can and does bring then it adds another dimension to an already fascinating sport. If you are lucky enough to represent your country at fly fishing then even better. I am fortunate enough to have represented England 3 times at International level always in the prestigious Rivers Team capacity. This is a meritocracy. To fish for England you have to enter a qualifying event. These are held all over the country in different regions and are advertised on this website https://te-ff.org/. If you qualify- this involves a high placing then you can go through to a 32 man final in the Rivers Format. 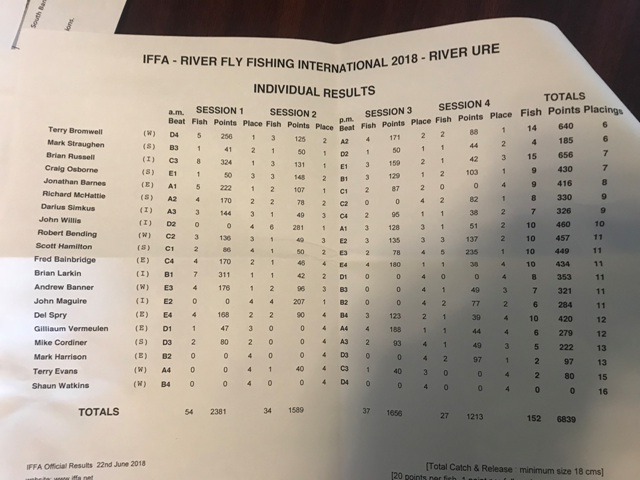 If you finish in the top 6 you will qualify for the Team the following year. I started competition Fly Fishing 20 years ago simply as a yardstick for gauging if I was catching as many as different Fly Fishers. I was a completely self-taught Fly fisher and I had no idea how many fish I was catching relative to others. I was in a club primarily concerned with sea trout fishing and their fruitful trout and grayling waters were exclusively or so it seemed at that time largely left for me to enjoy solo, undisturbed. Until one fateful day when I spotted another trout fisher on the opposite bank. Then another and another. By the time I saw the 10th angler I knew something must be going on. “Excuse me” I asked with obvious urgency “What is going on- why are you all on this water”. I was informed they were practicing for a qualifier to reach the final for a chance to fish for England. I asked if I could fish this competition and was told this was no problem if I turned up on the day with the entry fee. I remember my first competition for its farcical nature. I’d taught myself that only 10 inch plus fish were “real” fish and anything smaller was a by catch. So I only took the much bigger fish to my controller (referee) in the net for measuring before returning them and returned directly the many smaller fish until about half way through when my friend informed me that the many small fish I was returning were bigger than the 18 cm size limit. Despite the fact that I’d returned over half my recordable catch with no record I still finished third in the qualifier. This was a position that won me a place for the 32 place National final, which I duly won fishing upstream dry fly. This gave me an opportunity to fish at International level for the first time. That was an amazing experience with greats like Stuart Crofts and John Tyzack with many anecdotes including the infamous “Daceling cup”. This was a challenge between myself and Stuart Crofts. We were both very observant of “moving fish” and Stuart asserted that Grayling were rising in the canal adjacent to the Dee near Llangollen. I told him “No Stuart my good Captain they are but Dace- fish derived from suckers and not worthy of our flies” (the last bit I added as artistic licence- I used to love catching Dace on dries). So the challenge was laid out with an official adjudicator (Paul Page) as a duel to be performed at dawn to catch the daceling an extremely rare grayling dace hybrid. The winner was deemed the first to catch one on a dry fly. Knowing Dace are a bit spooky I found an undisturbed bit and flicked my midge pattern into it and almost instantly a Dace took it. Stuart then presented me with a Cup he already had made for the Event (how? )- engraved winner of the Daceling Challenge. Events like these that encapsulate camaraderie and respect are what I fish at this level for. It is always an honour to represent your country at your passion. After more than a decadal lay off from competitions due to work in India, I am back at that same level getting an adrenalin hit and fishing with the heart rate at 120 but calmly enough to fish with the composure required. 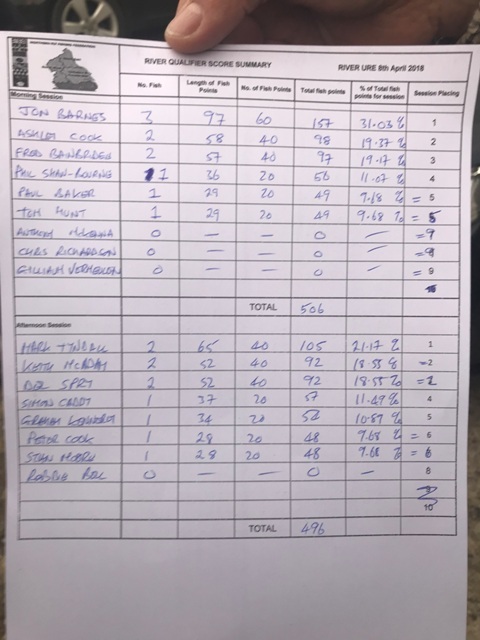 This recent Home Rivers International (June 22nd 2018)was on the Ure and I finished as top English rod and top of my section with 8 points. Going into the final session I was leading the whole event but a wretched, dramatic and heartbreaking last session ended in a blank score. Yes fly fishing can be more often associated with serenity but if you want to experience high drama enter competitions and fish at International level. In that final session I had spotted my blank savers. 4 rising grayling and although everyone took the dry I presented cleanly not one resulted in a hook up. Each one just like a kick in the proverbial balls in blistering sunshine and an increasing downstream wind. Fly fishing at this level can be physically and mentally brutal. The dries I used to great effect in the International are perfect for evening Summer days. 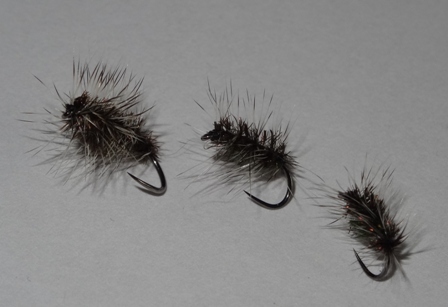 Griffiths Gnats in 16’s, 18’s and 20’s and “F” Terrestrials in the same l sizes. Remember to match with good tippet. The Asso soft is the strongest I’ve used relative to Diameter. I used the 4x for double and single nymphing during the International. Superb strength and diameter and softness make it as good or better than any fluorocarbon I’ve used for this purpose. Back in stock are our UV hares ear dispensers from Jan Siman. This stuff is the finest, easiest to dub with the nicest finish period. 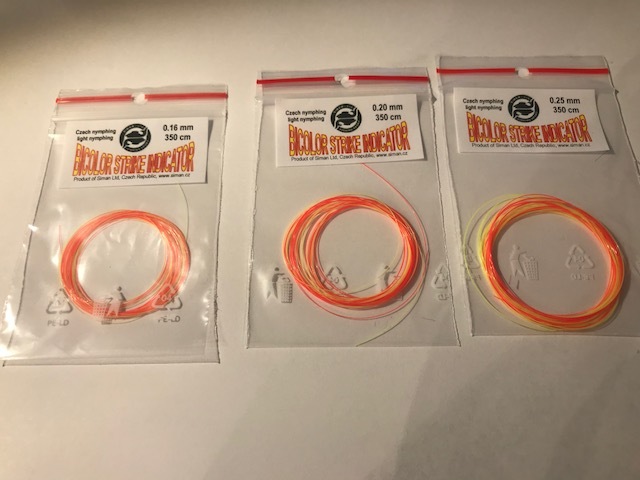 Also the full range of indicator products including the bicolour strike indicator line that helped me finish as top English rod in the recent International. There are variable diameters to suit size of nymphs at a realistic price of only £1.99 per 350 cm. The much requested Life Jackets and Lifejacket Lites are back with 50% more hair for even greater buoyancy. The Lifejacket with small beaded tungsten nymph 18 inches under it is a go to in any popply water. 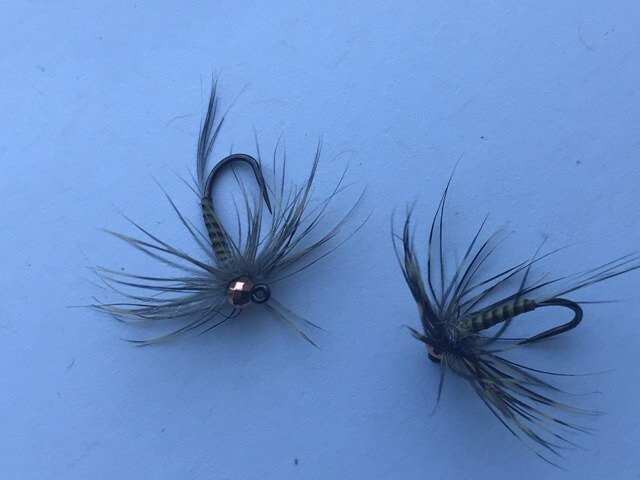 Our new copper tungsten faceted plover nymph is a superb duo nymph and has caught me may fish even on pressured water. .I have much to look forward to including a trip to Canada in September before another major competition the National Rivers Final on the Eden at the end of September. Before then there will be opportunity to just enjoy the relaxation and sheer enjoyment of fishing for wild fish in natural environments using artificial flies brings. I was lucky enough to be invited as a guest of Trevor Lloyd MBE to fish the River Teme. 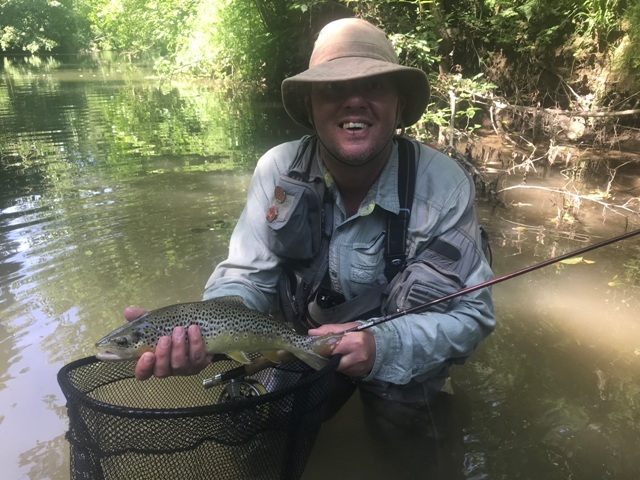 Despite the unlikely conditions with temperatures around 30 Celsius (around 86 Fahrenheit) I had an absolute blast tempting browns to a size 16 “F” terrestrial and the ever reliable soft Hackle dry and ended up with 18 quality fish as the picture shows. Using the furled leader and a relatively short tippet I was able to keep loops tight and get into gaps under branches . When the fly was taken it was always with the utmost fin waving confidence. Super fishing in those conditions.